A conservatory can make the most of your available space; a place where house and garden combine to create a very special ambience, through all four seasons of the year. A conservatory brings many delights; it creates a new living space and enhances the value of your property, bringing your closer to your garden. The Conservatory provides additional space to entertain your friends or relax with your family. Although conservatories are styled to complement many architectural designs of the past, they are constructed to the very highest standards, using the very latest materials and modern building techniques with the high security locking of all windows and doors. The result is a permanent home extension which harmonises perfectly with your homes prevailing character. 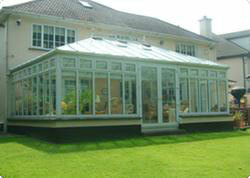 Contact us today for all aspects of your proposed conservatory.